In my previous post I promised to tell how I setup my own NXOS sandbox to experiment with OpenConfig on NXOS. Cisco's DevNet lab is very useful, but they cut you off after an hour or so and you have to start over. One hour is not nearly enough, so having your own sandbox is big help. You'll need Vagrant and VirtualBox. I used Vagrant 2.0.1 and VirtualBox 5.2.10 on Ubuntu 16.04LTS, but should work on OSX too. Clone or download Vagrant file and startup-config from my repo at GitHub. Vagrant will configure VirtualBox to forward sandbox's ssh port to port 5522, http (NX-API) port to 8980 and NETCONF port to 8830. In first case you'll be dropped into bash shell, type "su - admin" to get familiar CLI prompt. The password is "admin" (no quotes). In the 2nd case, just type "admin" when prompted. If you want to test OpenConfig models on NXOS, you also need to download RPM files from Cisco's devhub. The file names are almost self-explanatory and include model's name. For example, mtx-openconfig-if-ip-1.0.0-7.0.3.I7.1.lib32_n9000.rpm contains OpenConfig model for IP interface configuration. The space in bootflash is limited, so if you want to try all available models, install one RPM at a time and delete it. Now you can use any NETCONF client and push OpenConfig-compliant XML to the sandbox. I wrote my own simple script which you can find here. Standard disclaimer: use at your own risk, no warranty, yadda, yadda, yadda. Cumulus Networks promotes routing to the host via Host Pack software package as a way to provide host network redundancy without using proprietary MLAG or mostly incompatible EVPN ESI multihoming solutions from switch vendors. While Host Pack seems to be geared towards hosts running Linux containers, it got me thinking how can I do routing to bare metal host. The routing protocol of choice is BGP. Now I need an IP address on the interface that never goes down and make sure that my server and client applications use that IP. That same IP will be advertised via BGP from the host. Loopback interface is obvious choice for this kind of interface. The application can request a particular IP , the kernel will use the src hint from the chosen route path , or, lacking this hint, the kernel will choose the first address configured on the interface which falls in the same network as the destination address or the nexthop router. I want it to be transparent for the applications and left on its own, Linux most likely will select IP address of one of the physical interfaces. The only option left is to make sure that route to 172.16.99.0/24 on srv1 is programmed with src 100.100.100.100. In this lab I am using BIRD 1.6 to run BGP on srv1, but Free Rang Routing will work too. both routes are installed and claim to use 100.100.100.100 as a source IP address to reach srv2 network. Let's verify. I start pinging srv2 from srv1 and run tcpdump on srv2 side. As you can see, packets are coming from 100.100.100.100, even though I did not specify source IP address for the ping. And last test - failover. Since my lab setup is entirely virtual, the goal was to test if failover works at all and not how fast it does. You need real hardware to check the speed of failover. That 3-second interval of 0.00bits/sec is failover time. Again, since it's virtual environment, your mileage may vary. So, you read the industry websites, know that IP fabric is the next best thing in data center networking and decided to take a plunge and build your own. Nothing big to start with: 2 spine and 8 leaf switches. Now you realize that your IPAM system does not have API and you have to assign 16 IP addresses for transit links and 10 IPs for loopback interfaces manually. While not insurmountable task, it's tedious. Fortunately, Cisco's NXOS and Juniper's JUNOS let you configure ip unnumbered ethernet interface and now you need only 10 IPs for loopbacks. I created a small virtual lab of 3 NXOSv switches - 2 spines and 2 leafs - to test the concept. 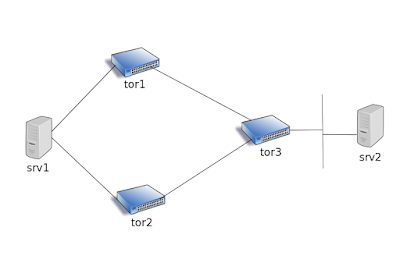 I could not make BGP work directly over unnumbered interfaces, so I configured OSPF to advertise loopbacks and BGP peering between loopbacks. To simplify configuration even more, I configured dynamic BGP peering on the spines. Why would you need BGP if you already have OSPF? You might want to run another next best thing - VXLAN with EVPN control plane. To run the lab you'll need Vagrant, VirtualBox, Linux machine with 32GB of memory and Vagrant package of NXOS from Cisco. You need to have CCO account and may be maintenance contract to download the image. Do not ask me to provide the image. I used NXOSv image nxosv-final.7.0.3.I7.1.box, Vagrant 2.0.1, VirtualBox 5.2.6 and Ubuntu Linux 16.04LTS. Although the lab worked with earlier versions of Vagrant and VirtualBox and should run on any Linux distro. run "vagrant up". Depending on the resources, it might take up 10 minutes for all 4 switches to come up fully. You can see boot progress by connecting to consoles: "ncat -U /tmp/", where are leaf1, leaf2, spine1 or spine2. After switches are up, you can log in by running "vagrant ssh ". You'll be presented with bash shell, to get to NXOS prompt, type "su - admin", password is admin. Disclaimer: this is in no way shape or form production-ready configuration and was not tested for any side effects. Use it at your own risk.